The Army Valorous Unit Award is a prestigious award for extraordinary heroism in action against an armed enemy of the United States in a single action or short period of time. It is the unit award equivalent of earning a Silver Star for an individual action. The highest unit award is the Presidential Unit Citation, with the Valorous Unit Award being the second highest. The Army Valorous Unit Award ribbon has a gold frame of laurel leaves surrounding 11 stripes in the pattern of the Silver Star Medal ribbon. The first stripe is 3/8 inch of Old Glory Red followed by 1/16 inch of Ultramarine Blue, 1/64 inch of White, 3/32 inch of Ultramarine Blue, 3/32 inch of White and a center stripe of 3/32 inch of Old Glory Red. The stripes then repeat in reverse order. 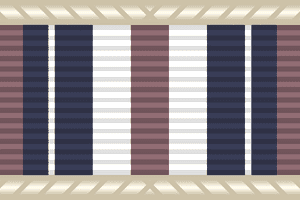 The streamers for the Army Valorous Unit Award are the same pattern as the Silver Star Medal ribbon. The action earning the Valorous Unit Award must have occurred on or after August 3, 1963. The action for which the award was given must involve armed conflict with an opposing foreign force or while the unit is serving with friendly foreign forces in an armed conflict in which the United States is not a belligerent party. The degree of gallantry, determination, and esprit de corps necessary for the awarding of the Army Valorous Unit Award is a lesser degree than that necessary to be awarded the Presidential Unit Citation. However, the recipient unit must have been recognized above and beyond other units participating in the same conflict for their actions under hazardous conditions in the achievement of its mission. The degree of heroism required is the same as that which would justify awarding the Silver Star to an individual under similar circumstances. It is not enough to have been in combat duty for extended periods of time or to have participated in several operational grounds or air missions. On most occasions, the award is warranted when units have taken part in single or successive actions that cover comparatively short time spans. The actions required for awarding the citation could not reasonably be performed for any extended time periods except under very unusual circumstances. Rarely will a unit larger than a battalion meet the qualifications for awards of this decoration. All members of the unit cited for the award are approved to wear the emblem of the Army Valorous Unit Award. The emblem is thought of as an individual decoration for those in connection with the cited acts and is approved to be worn if they continue as members of the unit or not. Other personnel serving with the unit are approved to wear the emblem to show that the unit is a recipient of the Army Valorous Unit Award. Army awards and decorations are approved in accordance to the guidance contained in Army Regulation 600-8-22. Rules for the proper wear of Army awards and decorations can be found in Army Regulation 670-1. The policy for display of unit awards on guidons and flags and supply of streamers is found in AR 840-10. A review of the unit awards program was carried out in 1965 in order to expand the capacity of the Meritorious Unit Commendation to include acts of valor, at a request from the Commander, USMACV. This study found that there was indeed a gap in the awards program as The Distinguished Unit Citation was awarded for gallantry in action for heroism that would warrant the Distinguished Service Cross to an individual and there was no lesser unit award for heroism. A recommendation was given to expand the capacity of the Unit Commendation to include acts of heroism. This recommendation of the review was not approved by the DCSPER, but rather a memorandum was sent to the CSA on 7 January 1966 to suggest am Army Valorous Unit Award to be adopted to show unit gallantry in combat equivalent to that required for an award of a Silver Star to an individual. The Chief of Staff approved this recommendation on 12 January 1966.